Goodness, you’ve done a lot. That dog is definitely waiting for the command, isn’t he? 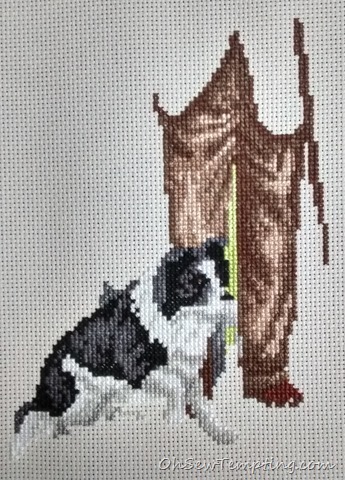 Even without the sharpening the outline stitching will give him, it’s very clear. Love his boss’ baggy corduroy trousers, too! Yes, I like the trousers too 🙂 The nice thing about the back stitch on this design is that it just hints and highlights rather than making the picture look like a cartoon. Which is good! Light detail rather than heavy outline. You are really getting ahead with this one Avis. The first dog is jumping out of the picture and looks brilliant. I love the dog! The James Herriot designs are great.I managed a bit more of my red geranium this time but progress is imperceptible so not ready to post yet. Great progress seeing dog & master come to life. If it doesn’t warm up here I’m going to have to put the stitching to one side and get the purple blanket knitting out. Max temperature so far this year is 14 degrees!